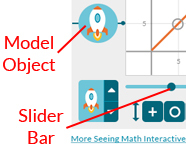 The Seeing Math™ Piecewise Linear Grapher (PLG) provides a real-time, two-way connection between symbolic and graphic representations of piecewise linear functions, so that changes in one representation instantly cause changes in the other. Users can display and modify each interval of a function. The Grapher lets you enter up to four linear functions and compare the characteristics of each. You can customize the x‑ and y‑axis, and add your own labels. You can also use a built-in tool to capture a screen shot of your work. The information presented here is designed to familiarize you with all the functionality of the Piecewise Linear Grapher. Each of these areas will be explained in this guide. 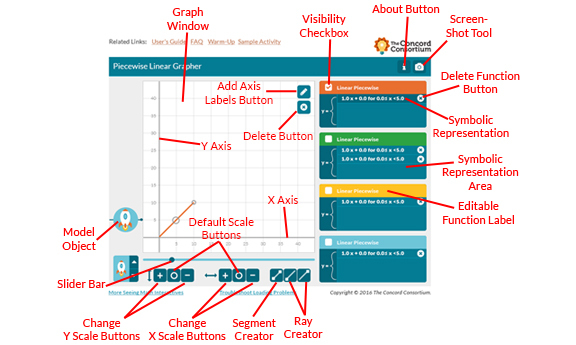 To use this guide, it helps to have the Piecewise Linear Grapher open. This will make the concepts clearer and allow you to experiment. When the tool first opens, you see a single orange segment starting at point (0,0) and continuing to the right and up until it reaches point (5,5). At the upper right, you see a piecewise function with a single symbolic expression. Notice how the symbolic expression matches the locations of the ends of the orange segment. If you move the line the numbers will change. If you change the numbers, the line will move. All functions are represented both symbolically and graphically in the Piecewise Linear Grapher. Click on it to select it. A selected line segment displays "handles" at each end. Click and drag either of the segment ends to change the length, slope, or y-intercept. Click and drag the anywhere in the middle of the segment (the line itself) to move the segment without changing its length or slope. Click and drag in the center of the ray to move it. The slope and length will not change. A ray has only one "handle." The other end (an orange arrow which may be hidden) goes off screen to infinity. Note The slope of a ray can only be modified using the symbolic expression of the ray. You can choose either a Point-Intercept Form or a Point-Slope Form by clicking the tabs. 1. Click in any of the squares with numbers to select them (they are blue when selected). 2. Use the up and down arrows on the right side to change the number. Changes in the numbers will be reflected in the line segment or ray. 3. When you finish, you can close the dialog box by clicking on the X in the box's upper right corner. To compare the visual representations of two or more functions in the graph window, you must make them visible on the graph. To add a new segment to a piecewise function, you must use the Graph Window. You can create as many segments or rays as you wish. • If there are no line segments or rays currently in the Graph Window, click first in the symbolic function area. Then click the segment creator or ray creator. The new segment or ray is created at the origin. 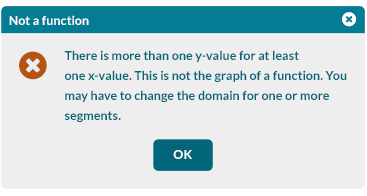 • If there is a segment or ray currently in the Graph Window, click the segment or ray you want to add to (or click its symbolic function area). Then click the segment creator or ray creator. A new segment or ray is added to the highest point of a selected segment, or to the end point of a selected ray. The Ray Creator on the left creates a ray approaching positive infinity. The one on the right creates a ray approaching negative infinity. Each of these is created off of the highest or lowest point of an existing function. When you add a new segment or ray, its symbolic representation also appears in the symbolic representation area. Once you have created a new function by adding rays or segments in the Graph Window, you can modify it as described above in Changing a Function. To create a new function when there are no symbolic representations in the Function Area, click the Visibility Checkbox, and then click the Segment Creator or Ray Creator. You may want to change the scale or axis labels to suit a particular visualization or problem. •	To zoom in along the x-axis or y-axis, click the respective zoom in button. •	To set the graph to default zoom level along the x-axis or y-axis, click the respective default zoom button. •	To zoom out along the x-axis or y-axis, click the respective zoom out button. Click the Axis Labels button. 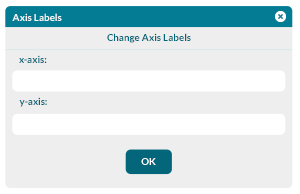 The Change Axis Labels dialog box appears. Fill in your label(s). Click OK to save the label(s) and close the dialog box. If you do not wish to make any changes, click the X in the upper right of the dialog box to close it. You may wish to add custom labels to the different functions in order to more clearly see which function represents what. For instance, if you were comparing functions representing three phone company offers, you could label the three functions with the names of the companies. 1. Click in the Editable Label box over the function. 2. 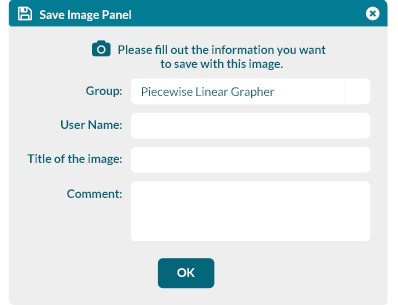 Highlight the existing label, "Linear Piecewise." 3. Type your new label. 1. Click the Screenshot button (a picture of a camera in the upper right corner). 2. Fill in the fields and click OK.
Another dialog box opens, with a web address where you can view your image. 4. When you are finished, Click on Close button to close the dialog box. If you are in an Seeing Math™ course and would like to share your image in the discussion boards, follow the directions under Technical Help, How to Share an Image from an Interactive. If you click and drag the slider to the left or right, a trace moves along the ray or segment, indicating the x position. Simultaneously, the Motion Object moves vertically (to the left of the graph window), indicating the corresponding y position. A small set of numbers—(1,1) in the illustration below—accompanies the trace to indicate its x and y coordinates. This is most useful for comparing more than one function and noting the different rates of change. Click the icon selector to choose your new icon from the collection offered.